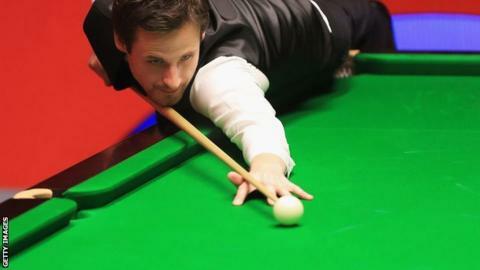 David Gilbert admitted he had been outclassed after his World Championship campaign came to an abrupt end with a 10-4 defeat by last year's Crucible runner-up Barry Hawkins. World number 31 Gilbert started the first-round meeting strongly with three 50-plus breaks to take a 4-2 lead. But Hawkins showed his class to reel off eight in a row, including all five in Wednesday's second session. David Gilbert on losing all five frames in Wednesday's second session. "Today I was just useless and Barry was great," Gilbert told BBC Sport. "He was very solid and he didn't miss anything easy." Hawkins looked out of sorts early on, but rattled off breaks of more than 50 in seven of the last eight frames. Gilbert, 32, said Hawkins deserved his win, but was upset with his own performance. "Barry was struggling but then he played three good frames yesterday and today I started bad and it just got worse," the Derby-born Tamworth-based player said. "I have to learn to play safe at some point. "If Barry carries on playing like that he will be a tough man to beat. I have no complaints about being beaten by the better man - and I was. "I just wish I could hit a couple of those shots again because I felt like I was in the match. "Perhaps I need to make more of an effort and practise more with the top players. I need to improve my overall game. I either play well or am completely useless."